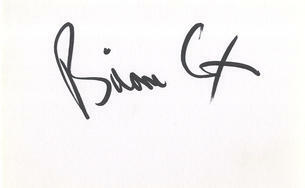 This is an In Person signed white card 5.75" x 4" by the Scottish actor. Brian Denis Cox, CBE (born 1 June 1946) is a Scottish actor. He is known for his work with the Royal Shakespeare Company, where he gained recognition for his portrayal of King Lear. He has also appeared in many Hollywood productions playing parts such as Dr. Guggenheim in Rushmore, Captain O'Hagan in Super Troopers, William Stryker in X2: X-Men United and Agamemnon in Troy. He was the first actor to portray Hannibal Lecter on film in the 1986 movie Manhunter.